Telomeres are the DNA-protein structures at the ends of linear chromosomes that enable cells to distinguish a chromosome end from a double-strand break (DSB) in the genome. DNA DSBs are potentially catastrophic lesions. If not repaired, DSBs can lead to extensive DNA degradation. Unchecked chromosomal degradation inevitably results in loss of genetic information and cell death. Even if repaired, DSBs can lead to loss of heterozygosity (if repaired by homologous recombination) or chromosomal deletions, rearrangements, or translocations (if repaired by nonhomologous end joining). Thus, without the distinctive telomeric structure, chromosome ends are at risk for degradation, recombination, or random fusion by cellular DNA repair systems. Telomeric fusions are particularly dangerous because they frequently lead to chromosomal instability (30-34). Owing to the biochemistry of DNA replication and the absence or insufficient activity of telomerase, mammalian telomeres shorten by 50-200 bp with each S phase of the cell cycle (14). Telomerase is the reverse transcriptase that can add telomeric sequences to DNA ends de novo (31,35). Robust expression of telomerase is generally restricted to the germ line and early embryonic cells, particularly in humans (36-38). Human somatic cells senesce when the average telomere length (or, more accurately, the average terminal restriction fragment length) reaches 4-7 kb (reduced from 15-20 kb in the germ line) (39). Ectopic expression of telomerase prevents telomeric shortening and replicative senescence in several types of human cells (e.g., fibroblasts, retinal epithelial cells, and endothelial cells) (18,40,41). However, telomerase does not prevent human fibrob-lasts from undergoing a senescence response to oncogenic RAS (42), nor does it prevent certain telomerase-positive tumor cells from undergoing a senescence response to DNA-damaging agents (43). Moreover, cells from laboratory mice have substantially longer telomeres than human cells, yet senesce after many fewer divisions, with much longer telomeres, and often despite expression of (endogenous) telomerase. It has been suggested that mouse cells senesce in culture because they acquire telomere-independent damage inflicted by the culture conditions (44-45), possibly the high oxygen in which most mammalian cells are cultured (46). Whatever the case, telomerase can prevent telomere-dependent (replicative) senescence but not telomere-independent (cellular) senescence. Recent findings suggest that cellular senescence is triggered by loss of the telomeric structure rather than telomeric shortening per se (34,47). Telomeric structure, and hence telomeric function, can be disrupted when the telomeres become critically short or experience damage from endogenous or exogenous sources. The telomeric structure also can be lost when there are changes in the expression, regulation, or structure of certain telomere-associated proteins. Mammalian telomeres are now known to end in a large loop, termed the telomeric t loop, the precise structure of which is not yet known (48). Telomeric t loop formation is critically dependent on the telomere binding protein TRF2 (48) and is likely facilitated by other telomere-associated proteins, such as TRF1 and TIN2 (48,49). 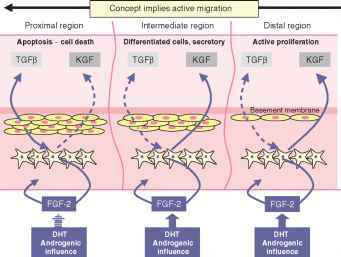 Disruption of TRF2 function (by expressing a dominant negative TRF2 mutant) causes immortal human tumor cells to die and normal human cells to undergo senescence (50). Interestingly, normal human cells can proliferate with subsenescent telomere lengths, providing telomerase is ectopically expressed (51). Many telomerase-positive tumor cells also proliferate indefinitely with very short telomeres. These findings suggest that telomerase may act preferentially on the shortest telomeres. The mechanisms by which dysfunctional telomeres signal cells to undergo cellular senescence or cell death are poorly understood.